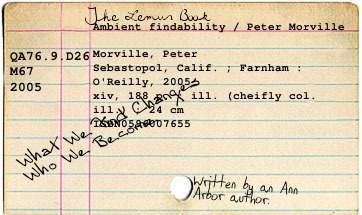 From Library and Information Science Foundations (LISF) and the story of documents Part 3 this catalogue card shows us the use of classification schemes within a cataloguing code using a 20th century format, the index card. It also provides some additional user created metadata added to the official typed record. An added identifier is “the Lemur Book” referring to the animals that usually distinguish the cover of an O’Reilly book. We also see something written on that links into the information retrieval themes covered in the Digital Information Technologies and Architecture (DITA) information retrieval themes and the contextual siting of search around a seeker and their information context and needs: “What we find changes who we become”.